Motor vehicle accidents are some of the leading causes of personal injuries in New Jersey. Over 240,000 car crashes occurred last year on New Jersey state roads alone. Auto insurance rates are high in order to cover the required payouts and settlements of many of these car accidents. Because car crashes can result in numerous injuries and expensive damage, it is necessary to file claims for reimbursement. Medical bills, pain and suffering, and repairs all add up. 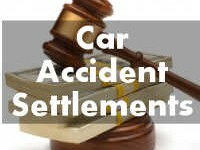 Each crash is different, but some motor vehicle accidents in New Jersey have resulted in very large settlements. In one of the largest personal injury payouts ever, a Bergen County jury required a Giants’ Stadium beer vendor chain to pay a total of $135 Million in punitive and compensatory damages to the family of a drunk driving victim. The driver was obviously drunk and continued to be served at the stadium, later causing the car crash that paralyzed a 7 year old girl. A $29.5 Million award was paid to the family of a boy on a motor scooter after he was hit by a car in Wayne, NJ. The boy suffered a traumatic brain injury. The family sued the driver as well as the helmet and scooter manufacturers. $3.5 Million will be paid over a 17-year-old victim’s lifetime for her injuries caused in an accident while on her father’s motorcycle. While she was a passenger, another vehicle traveling at a high rate of speed crossed over the yellow line into their lane, causing the crash. The victim suffered multiple fractures requiring extensive surgery, pins and plates, and rehabilitation. The state of New Jersey had to pay out $1.8 Million to a 17-year-old Elizabeth man who suffered injuries from an accident involving a state vehicle. The driver of the state vehicle lost control on the Garden State Parkway, causing the van to fall down an embankment, ejecting the victim who suffered spinal damage and brain injuries. A Garfield resident received a $3.5 Million award from an accident as a passenger in a limousine. The limo drove off the Garden State Parkway causing a crash that left the victim paralyzed from her waist down. A New Jersey nurse was awarded $2.5 Million after an accident that caused her chronic pain and brain injuries. The woman, whose car was struck by a truck, suffered a herniated disc, brain injury, anxiety, and depression, all which kept her from returning to work and caring for her child. $1.9 Million awarded to a 60-year-old woman who was permanently disabled after an accident in Bloomfield, New Jersey, on the Garden State Parkway. Her car was cut off by a commercial truck, causing her to lose control of her vehicle, resulting in traumatic brain injuries. Every accident is different, but even in New Jersey, a No Fault state, there are still ways to recoup costs incurred by motor vehicle accidents. When people are injured and property is damaged, it is important to know where to turn to get some of those costs returned to you. That’s where the experienced New Jersey car accident lawyers of The Law Offices of Jonathan F. Marshall can help. Contact us today for a free consultation.